Stunning build of a fine looking space fighter. I think the treatment in blue makes it stand out o much more - we've seen so many red versions done over the years. Looks fantastic! Are there instructions anywhere for the assembly of that x-wing? 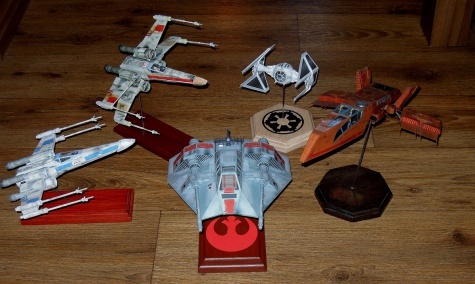 they are at X-wing paper model - Instructions , look at the in-progress photos as well, sometimes they're more useful. OK - I just came across this place by accident this evening while looking for other stuff and.......HOLY @#$%!! This is simply amazing! I could have sworn I was looking at a studio model of red 2 - the detail you've put into this is simply unbelievable - and built out of paper to boot! Being a long time Star Wars fan, all I can say is that I'm totally blown away by this. Well done and an excellent job! Just to inform you: In the annual papermodeling competition at kartonist.de, I have just started a construction report on this very model of the X-Wing, scaled up to 1/33 scale to make it compatible to my other airplane models. @ Sagittarius: Any chance to get your blue textures someday? Would be great! Love the idea of the TIE fighter/bomber kills. Non Sufficit Orbis-The world is not enough. sparrowhawk: cool, good luck with the competition! As for other color variants, maybe in time; I started working on some but never finished. No problemo sparrowhawk. I can send it to you maybe on wednesday if you want to. But I have only 200 mpi version which is not suitable for 1:33 scale.. it is up to you.